For Chamber Orchestra: Strings, Woodwind, Brass, and Piano. I value my own dignity: the empathy, tolerance, and respect others show me. When weak or thoughtless I do not always honour the dignity of others, perhaps when they are dissimilar to me, with those I disagree with, when someone is hurtful, foolish, and at times: with the young, old, poor, or infirm. There are moments too when I fail to treat those closest to me with dignity. Honesty ~ free of deceit; a sincere search or presentation of truth. Respect ~ acts or attitudes of concern for the feelings, wishes, or rights of others. Honour ~ to recognize or consistently hold qualities of respect and honesty. To acknowledge someone's dignity is to honour another's privacy of body, home, thoughts, feelings and identity. This work supports the The Rights of Living Things, a declaration of how we act towards one another. As I describe my thoughts, your experience of the sound, light and words may take you on a very different path. The difference of our journey is not as important to me as the exploration and consequence of the idea, expression, and gift of dignity. A chamber orchestra is a relatively small group of instruments that produces an intimate sound. The listener hears distinct instrumental voices throughout, even when several play together. When combined with words, music has the potential to heighten a text's meaning into felt experience. At the very least, with language, music gives rise to thought. The piece begins with a chordal musical phrase played by wind instruments before being joined by strings. The phrase recurs with variation in one form or another throughout the first and last third of the work. The pace is slow and deliberate for some time before the piano eventually injects its curious rhythm and colour. In the second third, the pressure of short insistent waves gives weight to a stepping bassoon that supports the long sustained notes of the trumpet and oboe. The momentary but lyrical harmony of just a few bars towards the close of the second section symbolizes the beauty that so often accompanies dignity. During the later part of the piece reed instruments drone and surge slowly as strings continue their journey by repeating the chordal phrase at the start of the piece. The hesitant piano part is different to when we first heard it and plays with reversed voice before ending the piece gently with the violin, viola, cello and bass. Communities require dignity to flourish. As I listen, the restrained yet persistent character of the music reminds me of those with quiet dignity, and the immense value of its giving and receiving. The Bonobo monkey is endangered and may be extinct within thirty years. I present the image of a different species to recognize that dignity is not limited to how humans act and feel towards one another, but in the hope dignity is acknowledged as something experienced and required across species. As our closest relative, bonobos share around ninety nine percent of our DNA. They, like many animals, have a rich emotional life. Perhaps if we accept dignity as important to the bonobo, we might also consider this as a right for other sentient beings. 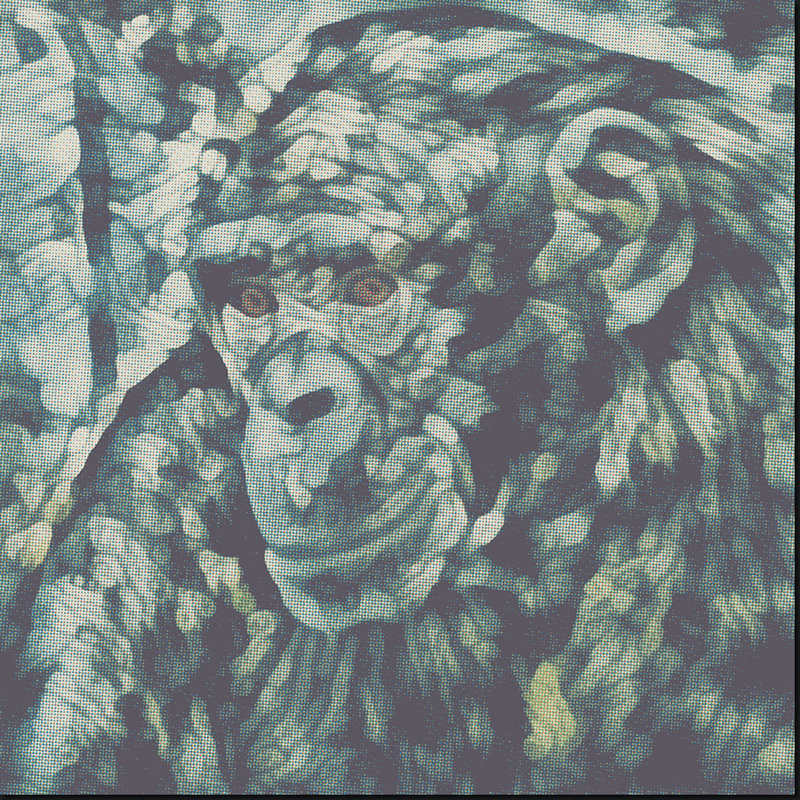 The image of a primate is made from irregular fragments of light that are symbolic of our imperfect, multifaceted, shared nature. 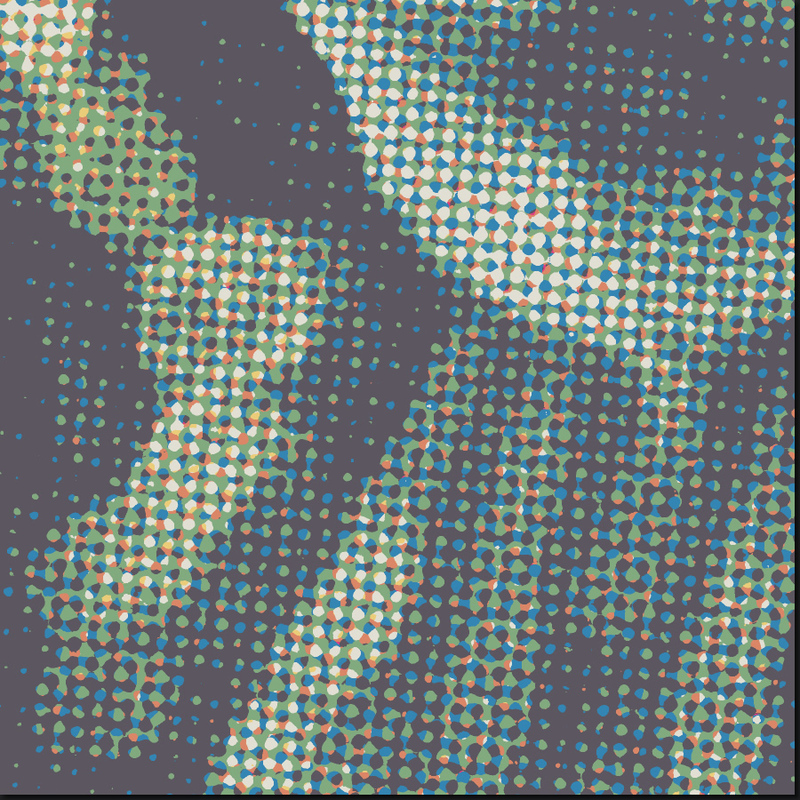 The patterns of dull colour and grey are not perfectly horizontal, and this creates a certain torn quality to the edges of the image. The overall stylistic impression is of an old cartoon, something represented, something portrayed, as if but a glimmer of the real. I look upon the image as a being with dignity. Whether supported or undermined, recognized or ignored, the level of my dignity is at the centre of who I am and will become.